The Party Bus – I spent this past Labor Day weekend at Nemacolin, along with a group of friends (about 25 other families, totaling over 90 people), and it was a great time. One moment that really stood out was when a group of about a dozen of us waiting for a shuttle bus to take us from dinner back to our hotel at around 11 p.m. Nemacolin is such a large property that they run shuttle buses all day and night to transport their guests from one part of the property to the next. A shuttle pulled up and as I started to enter it, the rest of my group said, “That’s not Helen! We called for Helen. We will wait.” I looked at them and said, “Are you crazy? It’s late, let’s get on the shuttle.” The kids were exhausted, and I just wanted to get back to my hotel room at this point. However, the rest of my group wouldn’t budge. They were dead set on waiting for Helen. So out of curiosity I waited to see what all the fuss was. Soon after, a shuttle pulled up and the doors swung open and the party started. 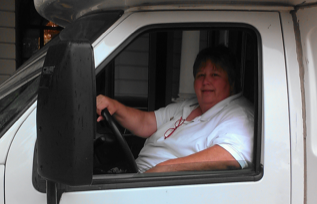 Helen Owns Every Moment – Helen Humphrey has been a Nemacolin legend for over 9 years. Guests love her and request her shuttles all the time because she plays music and flashes the interior lights to the beat of the music (which is why she is also known as Disco Helen). She interacts with guests via the intercom, asking who has never been here (i.e. 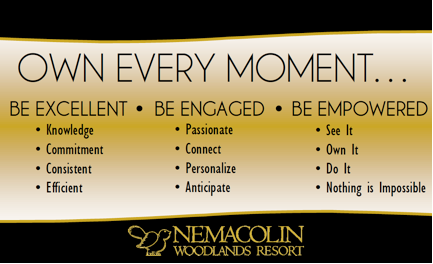 “who is a Nemacolin Virgin), finding all sorts of ways to entertain her passengers. She has the “Party Bus.” Helen has been known to go shopping for guests and bring them items so they never have to leave the property. She also received the “Fan Mail Award” in 2011. This is given to the associate who receives the most positive name mentions.